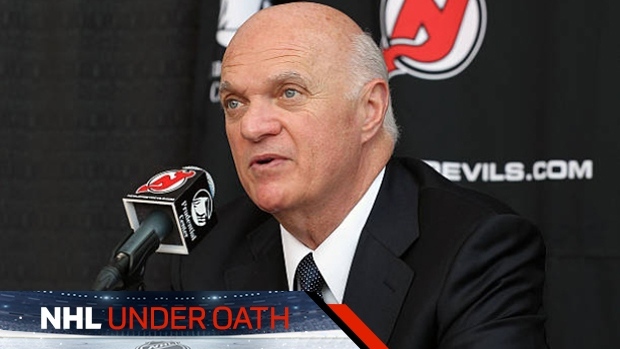 Former New Jersey Devils general manager Lou Lamoriello testified he was blindsided by the news that onetime Devils enforcer Mike Peluso, who has been diagnosed with dementia, blamed the Devils for not protecting him better when he was an NHL player. During a Jan. 22, 2016, deposition in Toronto, Lamoriello said that his reaction was “complete surprise and disappointment” after reading a May 1, 2015, article in the Bergen, N.J., Record newspaper that quoted Peluso saying he held the Devils responsible for his health problems. Peluso has said in both a civil lawsuit and in a workers’ compensation case that he suffered a string of seizures while playing in the NHL, that the Devils and other teams allowed him to keep playing and fighting even after he began suffering seizures and that they fraudulently hid medical files that showed Peluso had brain damage. Lamoriello’s testimony is among 31 depositions obtained by TSN in connection with the NHL concussion lawsuit and his comments are revealing on several fronts. That mantra of secrecy adds to the spectacle of the three-time Stanley Cup-winning Lamoriello’s 364-page deposition. Lamoriello has declined to comment publicly on Peluso’s allegations and the deposition includes his first known remarks about his former player’s charges. Lamoriello was asked about Peluso’s return to the Devils lineup in December 1993, days after suffering a concussion. Peluso’s brain injury at the time was so bad, Devils massage therapist Bobby Huddleston said in a 2016 interview with CTV’s W5, that a confused Peluso dressed, undressed and showered at least four times following a Dec. 18, 1993 game against the Quebec Nordiques. Peluso was hospitalized that night. Peluso returned to the Devils’ lineup days later and hit his head on the ice again, this time during a fight against Toronto’s Ken Baumgartner on Dec. 23. “Assuming that Mr. Peluso did get into a fight with Kenny Baumgartner four [sic] days after suffering a concussion, do you think that was safe for him to do so?” Stuart Davidson, a lawyer for the plaintiffs, asked Lamoriello. Lamoriello also said that Peluso, whose NHL career spanned from 1989 to 1997, made the decision to play and to fight. Peluso’s lawyer, Shawn Stuckey, said it was ridiculous for anyone to claim Peluso was making his own decisions about playing. “Mike got a call from his coach who said that the Maple Leafs had guys like linebackers and he needed Mike to protect his teammates, and that’s the reason Mike went back to play so soon,” Stuckey said in a March 15 interview with TSN. Lamoriello, who was named president of hockey operations of the New York Islanders on May 22, declined through a team spokesperson to comment on his testimony. On Feb. 14, 1994, two months after his injury in Quebec, Peluso had a seizure and collapsed while working out on a treadmill at a Florida hotel. Four days later, on Feb. 18, The New York Times reported that Lamoriello said Peluso’s seizure was primarily due to dehydration and lack of nutrition. The Times also reported the Devils were worried Peluso’s seizure could be related to his Dec. 18 concussion. “Did you ever give any statements to the press about a seizure that Mr. Peluso suffered?” Davidson asked Lamoriello during the deposition. After Dr. Ruderman’s warning, Peluso went on to have another 99 fights in the NHL, 71 of them while he played for the Devils. “…You would agree with me that Mr. Peluso continues to fight for the New Jersey Devils after this letter was sent?” Davidson asked Lamoriello during his deposition. Lamoriello was asked during his deposition about fighting in the NHL. He said he supports it. Lamoriello said Peluso was well liked as a Devils player and that he was among a group of “intimidating” players who had both size and strength. Fighting, Lamoriello said, was part of the “fabric” of players like Peluso and his Devils’ linemate Randy McKay. Lamoriello was asked about the NCAA’s move to outlaw fighting in hockey, one that he says has led to more cross-checking, more hitting from behind, and more spinal injuries. Lamoriello was also asked whether he knows if his NHL coaches have ever told their players to fight. He said he meets regularly with his players and has never had a player tell him that they’ve been ordered to fight. Lamoriello said that he had heard Peluso was working as a hockey scout when he learned of Peluso’s medical problems through the Bergen Record newspaper story. “I felt very bad for Michael, and I even asked a couple of our players if there was anything they thought I could or should do,” Lamoriello testified. “Did you do anything in response to the article to see if any assistance could be given to Mr. Peluso?” Davidson asked. “No. I – I stayed away from it,” Lamoriello answered. “And why is that?” Davidson asked. “Because I felt that – I saw there was a suit involved…I felt that my best – the right thing was I should not be involved in any comments or get involved with making it appear that I’m trying to do something to – you know, I have nothing to hide,” Lamoriello said. In a Nov. 15, 2016, decision obtained by TSN, a California Workers’ Compensation Appeals Board commissioner ruled the Devils “wrongfully withheld” two documents that Peluso’s legal team has said are crucial to his case. One document that was not properly produced was a Dec. 18, 1993, medical report confirming Peluso did suffer a concussion in his fight with Twist. The second document was Dr. Ruderman’s Feb. 21, 1994, neurology report warning the Devils that Peluso could have more seizures if he suffered more head trauma. In a May 10, 2018, court filing in his civil lawsuit against the Devils, Peluso’s lawyer alleged that he obtained 43 documents on Sept. 1, 2017, that were not properly produced during the discovery period in his six-year-old workers’ compensation case. Among the documents Stuckey said he obtained in September 2017 were diagnostics that included a electroencephalogram, or EEG – which uses sensors attached to the head and hooked by wires to a computer to measure brain waves – showing Peluso had suffered temporal lobe damage directly after his February 1994 seizure. “Defendants should have immediately forced Mr. Peluso to retire and should have taken all efforts to prevent him from playing again,” Stuckey wrote. The franchise is under different ownership since Peluso first filed his workers’ compensation claim six years ago. In August 2017, the defendants – the Devils, St. Louis Blues, Calgary Flames, Ottawa Senators and their insurers – offered Peluso $325,000 (U.S.) to settle that case.